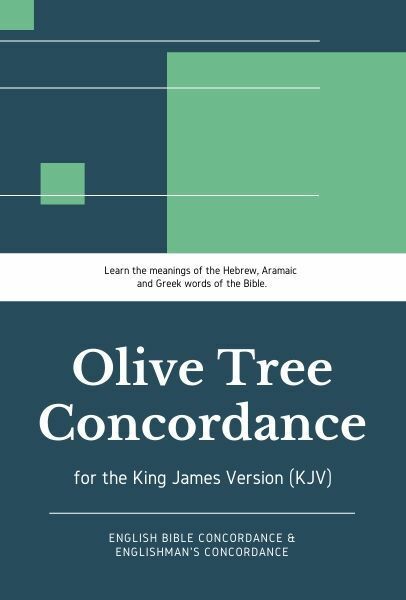 The Olive Tree KJV Concordance is both an English Bible Concordance and an Englishman's Concordance! This powerful resource will greatly enhance your word studies, and works with the Dictionary Look up feature in The Bible Study App. It is a great way to find cross references and the different meanings of the Hebrew, Aramaic and Greek words in which the Bible was written! The English Bible Concordance allows you to look up an English word to see the list of verses in which the word appears. It also gives the Strong's number linked to the Englishman's Concordance, and a link to the Strong's Dictionary entry for each verse in which the word is found. The Englishman's Concordance starts from the Strong's number, and provides a list of verses and the English translation, linked to the English Bible Concordance, used for the original language word. It shows the Strong's number, the word in both original language and transliteration, and the Strong's dictionary entry for the word.